Chadar Trek from Altitude Adventure India. 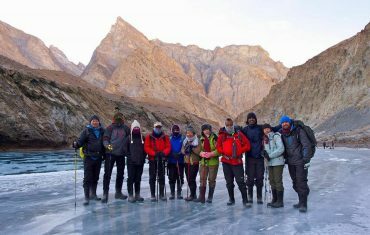 For the Chadar trek we have one of the oldest and best chadar trek organizers team in India, which has people from Zanskar region who are renowned for their hospitality as part of the team. This team is one of the pioneers of Chadar trek in India and have taken thousands of trekkers over the frozen Zanskar river. We were one of the first to introduce double sleeping bags for the Chadar trek to deal with the extreme cold conditions at night. You will meet a representative from Altitude Adventure when you arrive in Leh. All trek related queries are handled by our own team. As soon as you book your trek we assign you a ground coordinator who will be responsible for all your arrangements for this dream trek. If you need guidance on Chadar Trek and its preparations, we will assign you a Chadar Trek expert from our team- NOT from a call center. You will get answers to all your personal queries about the Chadar trek from this expert. We will ensure that you will have a memorable Chadar trek. If you want to go for Chadar trek 2020 with Altitude Adventure India and have an experience of a lifetime click here. What is the chadar trek? 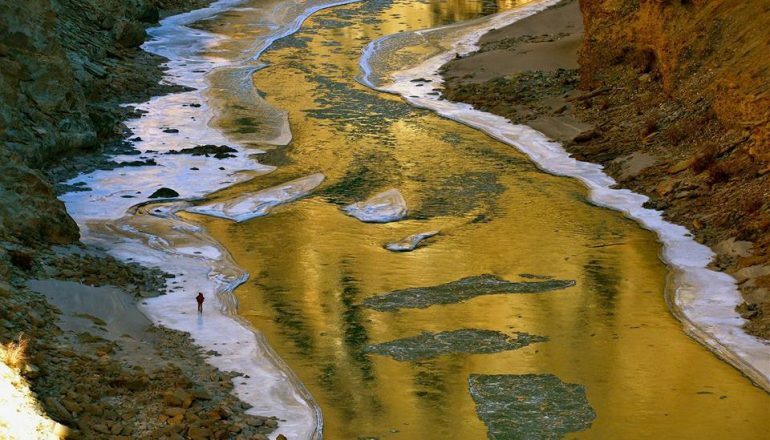 The Chadar trek is a walk on the frozen Zanskar River which lies deep in the formidable mountains of Ladakh, India. It is a trek of epic proportions taken under challenging weather conditions that see Leh Ladakh temperature drop as low as -25C in the night. It is now classified as a moderate trek. Chadar trek altitude is over 11,123 feet. What is the story behind the Chadar trek ? In the months from November to February, the district of Zanskar in Ladakh is almost entirely cut off from the main city of Leh leaving its inhabitants stranded with no road connectivity. 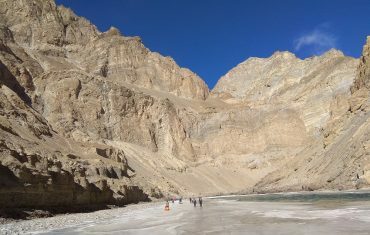 The residents of Zanskar learned to tide over this challenge by using the only other way to find a passage to the main valley, i.e. by walking on the frozen Zanskar River. The Villagers learned to brave the sub-zero Leh Ladakh temperature and challenging terrain to reach the nearby town for their bare necessities, healthcare and other needs. 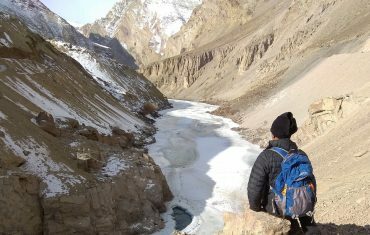 This seasonal route came to be known as the frozen river trek or the Chadar trek, as the frozen zanskar river appears like a sheet (chadar) of ice. When the adventure community discovered this traditional route they wanted to experience the same hardships and challenges which the locals braved and get to see some beautiful landscapes only possible to see in the extreme cold Leh Ladakh temperature. And thus the Chadar Trek or frozen river trek was born. It is considered as one of the toughest treks in India. Thousands of trekkers now flock during the winter months to experience thrill and fun in its raw form. There are several trekking packages in India available for the Chadar trek which is now considered to be one of the best treks in India. In spite of the hardships, the Chadar Trek is definitely one of the treks you must try. Pick up any travel magazine and you will be able to see countless pictures of trekkers walking on a frozen river trek under harsh conditions. Many of these magazines have countless reviews about the enchanting beauty of the Chadar and have voted it as the best treks of India. Trekkers brave the sub zero Leh Ladakh temperature and arrive in Leh in winter to participate in this epic trek. For most it is a bucket list item and they have planned this for years and probably attempting as their first trek. This seemingly improbable scenario is the essence of the Chadar trek. The experience of a frozen river trek in sub zero Ladakh temperature of is one of its kind. The entire trek trail is very picturesque and the frozen river provides an extremely serene and beautiful location with a peaceful atmosphere. The real magic exists below your feet and you are unlikely to have seen anything quite as remarkable as this frozen river stretching far away out of sight. Watching the spell-binding panorama as you walk will give you memories that you will cherish forever. The highlight of the frozen river trek is a beautiful frozen waterfall that you will see near Nerak village. Hidden between two hillocks is this natural formation of a 50ft frozen waterfall masterpiece which can only be seen to be believed. Success in this strenuous trek offers the trekkers a sense of satisfaction and exhilaration that can be compared to none. 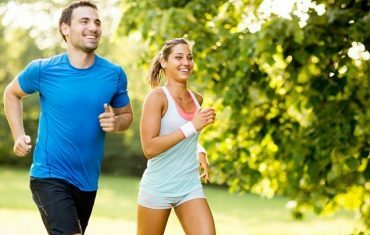 The trek has definitely become very famous now and many trekking packages in India are available for the travel and adventure enthusiasts. Select the best chadar trek organizers who will take care of your comfort and safety. 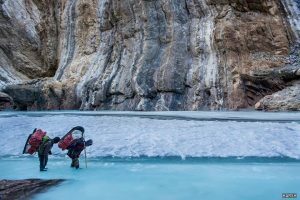 The fame associated with this trek can be gauged by the fact that films have been made on the Chadar Trek by the coveted National Geographic and Discovery Channels. People coming from the trek also have numerous stories to narrate of their incredible experiences and have unanimously voted it as one of the best treks in India. The trek is certainly not easy, but if you are enthusiastic enough, then this a must-do once in a life-time experience. Proper training and guidance is required prior to the trek and you need to select one of the best chadar trek organizers for successfully completing this frozen river trek.